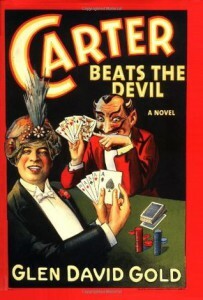 Carter Beats the Devil, Glen David Gould, Hyperion, 2001, ISBN 9780786867349, 496pp. Ever since I was a child, I’ve been fascinated by magic. The books I sought out in grammar school were ones that had magic in the title (Andre Norton’s are the most memorable). I bugged my parents one year for a magic kit and received it for a birthday or Christmas present, I can’t remember which. But I never became adept at performing tricks, preferring to be the fooled instead of the fooler. I wanted to believe in magic, to live in the world of imagination, and understanding how a trick was actually performed was too much of reality. Thirty years later, I seek a different magic–that achieved by putting specific words in sequence to illuminate a different reality. Glen David Gold’s book has that magic, as well as the magician that I could never become, Charles Carter, as its hero and protagonist. Gold’s sleight-of-hand is deft, as he takes real personages like Carter, President Warren G. Harding, and Harry Houdini, and performs a virtuoso illusion of history, a history that you want to believe in, because Gold’s patter and delivery is so strong, and one that you don’t regret having believed in because it is so good. The prologue sets the mystery up. Pres. Harding attends a San Francisco performance of Carter the Great’s magic show, including taking part in the infamous third act entitled “Carter Beats the Devil,” which the audience is instructed not to reveal any of the details so as not to ruin it for future crowds. Unfortunately, Harding dies later that night, and Carter becomes a suspect, if only in rumor. His mysterious nature may prove his downfall as first the details of his third act are published in the paper, details that only further the gossip that he might have had a hand in Harding’s death. The novel then moves back in time to show us how Carter got to be in that place, including his discovery of a book on magic when younger and his slow rise through the vaudeville circuit, including his sudden leap to fame. I can’t say anymore, because any more might destroy the illusion. This is a deft work, made all the more so because it is the author’s first novel. The easy comparison is to that other recent bestselling historical revisionism, Michael Chabon’s The Adventures of Kavalier and Clay, and while the two have some similarities, they are vastly different in theme. Gold’s is more of a thrill ride than Chabon’s exegesis on how superheroes are an inherently American phenomenon. While I enjoyed Gold’s book tremendously and highly recommend it, it doesn’t have the deeper layers of meaning of Chabon’s work. Previous: A Canticle for Leibowitz, Walter M. Miller, Jr.